This wonderful little tortoise is endemic to South Africa and is found specifically in the Western Cape and slightly into our area of the Eastern Cape where Shamwari Game Reserve is found. In my more than seven years at Shamwari this is possibly only the tenth time that I have seen one of these rare and beautiful little creatures. Like its larger relative, the Karoo Cape Tortoise, it has only four toes on its front feet. It has a sharp, distinctly hooked beak and the nose of the males become bright orange or red in the breeding season. To see a purple and green tortoise with a red beak is quite spectacular. Due to its tiny size, this tortoise is heavily preyed on by crows, jackals, dogs and a wide range of other predators. Consequently, it spends most of its time hiding under rocks, foliage and other cover. It is threatened by traffic on roads, overgrazing, introduced species and poaching for the pet trade as these “padloper” species do not generally survive well in captivity and due to their small size, exquisite looks and “cute” factor are in high demand. No other region on earth houses a greater diversity of tortoises than the subcontinent of Africa. This area includes the countries of Namibia, Botswana, Zimbabwe, Mozambique, Swaziland and the Republic of South Africa. We have five genera and 14 species. Three of the genera and 12 species are endemic. This means they occur in no other country in the world. 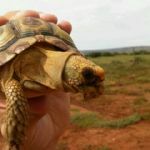 The area is also home to the smallest variety of tortoise known as the Speckled Padloper from the wide-open spaces of Namaqualand. Males of this species seldom exceed a carapace length of 6 centimeters and a weight of less than 70 grams. The term “padloper” in connection with a tortoise is an Afrikaans term. It literally translates to pathwalker, road walker or even trail walker.